It seems Sarah Palin has done it again. Just when you think she could not be any more hypocritical, she just does it again. From "death panels" and government spending to "retards," Sarah Palin has opinion on everything, and it always seems to contradict something else she had said or supported. This time, it is in regards to "death panels" and universal health care. 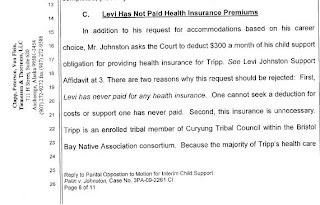 In a short article on the Huffington Post, it has been disclosed that Sarah Palin's grandson, Tripp Palin Johnston, receives free federal health care through Indian Health Services and the Alaska Native Medical Center because Tripp is an enrolled tribal member of the Curyung Tribal Council. It is also interesting to note that Todd Palin, Sarah Palin's husband, also has Native Alaskan heritage, which by my understanding would qualify their children to receive free federal health care through IHS. This raises the question - How come federal health care is good enough for the Palin family but not for the rest of America? I am sure Palin proponents will just attack this most recent discovery as just complaints from a bunch of people who hate the former vice presidential candidate, or maybe a spin saying those attacking Palin are attacking the Native American community, but the truth of the matter is Tripp can receive free health care because of his heritage but other Americans cannot, and because it would be unfathomable to believe Palin would want any harm to come to her grandchild, then it is safe to come to the conclusion that she is a hypocrite. While she is enjoying the benefits of this program, she wishes to deny others. It's not her failt. She forgot to write that it was government health care on her hand. The document says that he graddaughter qualfies for free healthcare. It does not say anything about if anyone sought to have this benefit or if the benefit was used. This is sloppy reporting and potentialy libelous. And by the way, Tripp is a boy, not a girl.